This type of design have also been recently covered at As Easy As Riding A Bike, and David Hembrow has previously discussed this Dutch bike-friendly bus stop design too. I recommend following those two links to see excellent Dutch designs. If you require physical, concrete proof that the authorities don’t care about cycling, take a look at a bus stop. The design will almost certainly give priority to private motor vehicles, with public transport a poor second and bikes a very distant third. Consider this fairly standard bus stop design (although it’s lacking the yellow ‘bus stop box’ markings). What will happen when the bus pulls in? The bus pulls in and blocks the cycle lane, so that cars can pass freely. 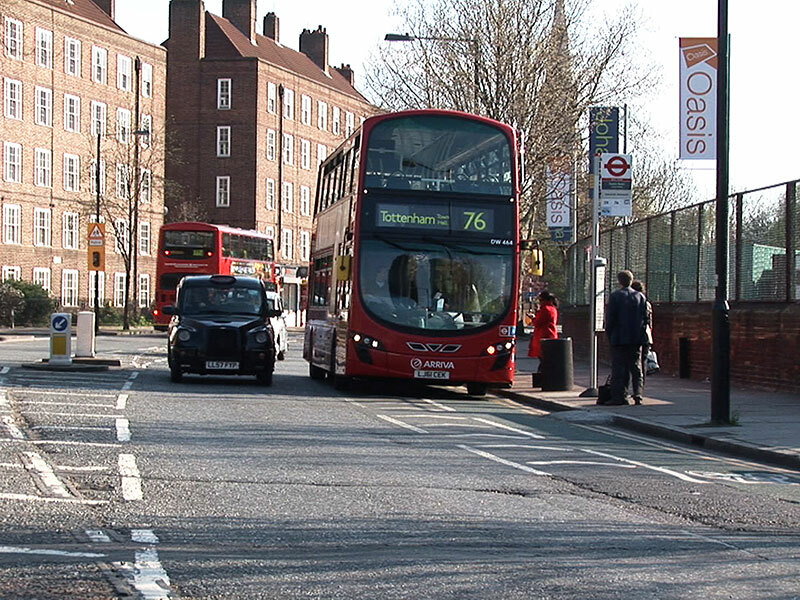 The bus has pulled in to the bus stop, which blocks the cycle lane, enabling those very important cars to pass freely. Come on children, take the lane! Do it for the Cycling Revolution™! 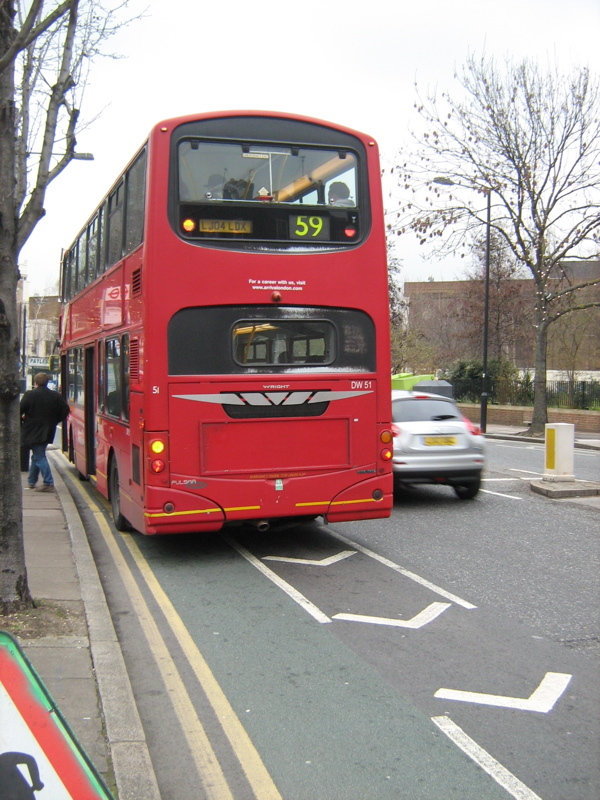 This is the contempt with which the UK authorities see cycling — and buses are given second-rate status too. 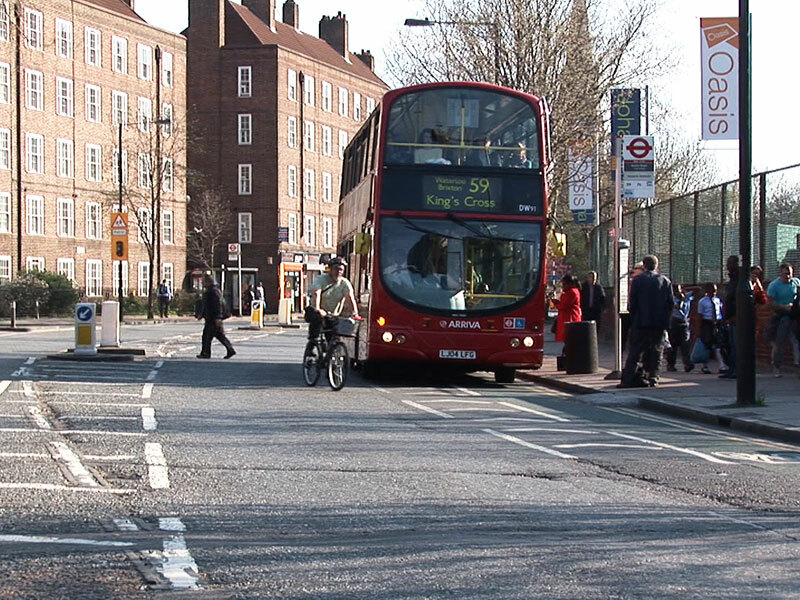 For not only do people riding bikes have to pull out to pass the bus (a terrifying place to be for most people) but when the bus is ready to set off it has to wait until there is a gap in traffic before it can pull out itself! There, in one pithy design, is proof that the private car comes above all else. And it’s the standard design for bus stops in the UK, and it’s one reason why ‘normal’ people don’t ride bikes for transport. The constant leapfrogging between bikes and buses is a terrible way to organise traffic flow. 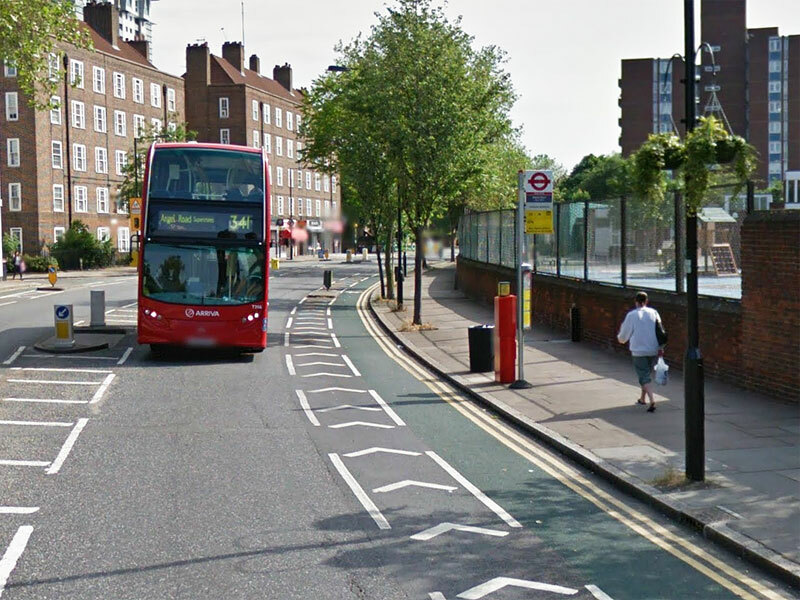 An alternative bus stop design, the likes of which are now being suggested by TfL. There’s no loss of space to pedestrians, as the cyclepath would run over where the bus stop is currently located (i.e. you can’t walk there anyway due to the bus stop, ticket machine and bin). In fact, add the footpath and the bus stop island together and there’s actually more space for people on foot because the part of the road which was previously covered in stripes of paint is now the bus island! I never thought I would praise TfL, but that is what we must do, for they have finally seen the light and realised that nearly everyone doesn’t like riding bikes amongst motor traffic. (Seems fairly obvious to me, but there you go.) Congratulations to whoever got this new design through! 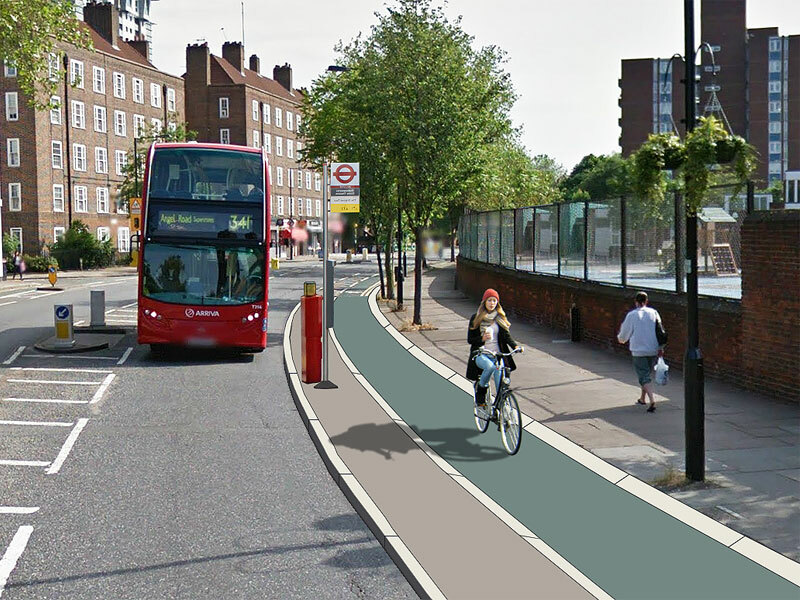 So it’s great that TfL are now planning this kind of design for the extension to Cycle Superhighway 2, and it’s the kind of thing which is normal in the Netherlands, and it works very well. Once you’re already dealing with a separate cyclepath it makes sense to put the bus stops on islands between the cyclepath and the road. 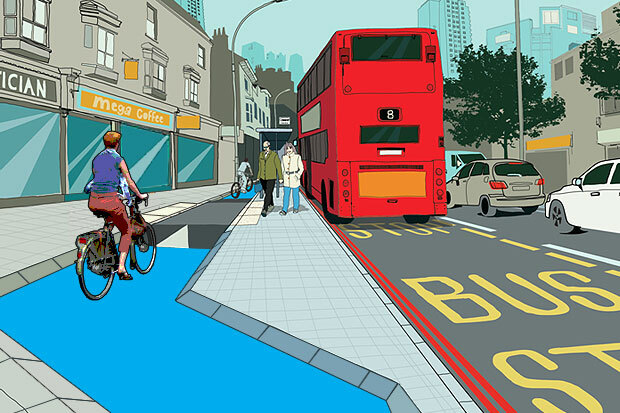 TfL’s artist’s impression of a cyclepath with bus stop bypass. Note their fast Cyclist, no doubt about to collide with those innocent pedestrians. My amended version of TfL’s design. I also changed the cyclist to a lovely middle-aged woman who isn’t going to run anyone over. “Please, go ahead.” “No, after you!” “Why, thank-you!” “You’re welcome. Have a nice day!” Etc. etc. I’m still not keen with how the cyclepath crosses the footpath – who has priority here? For me, this could be clearer. 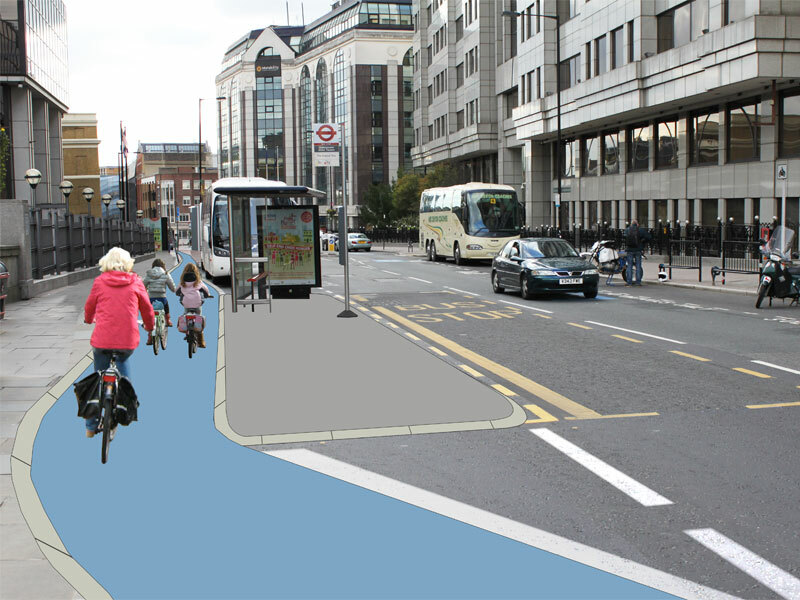 A better way to handle buses and bikes at Southwark Bridge. The bikepath runs along where the bus shelter was, and the bus shelter has been moved to where the bus stopping area was. 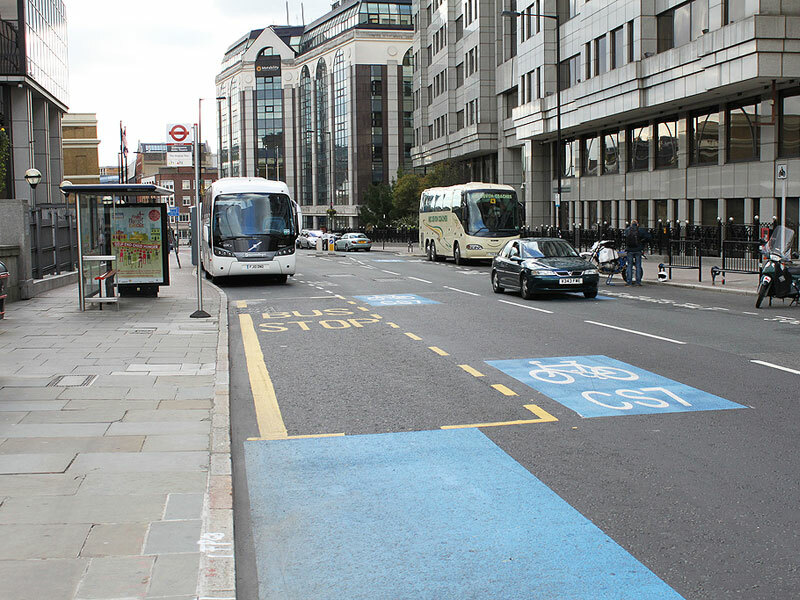 The bus stop markings are now in the main carriageway, which means – shock, horror – that cars have to wait behind stopped buses while people on bikes can ride past. Anyway, that’s all I have to say about bus stops for now. 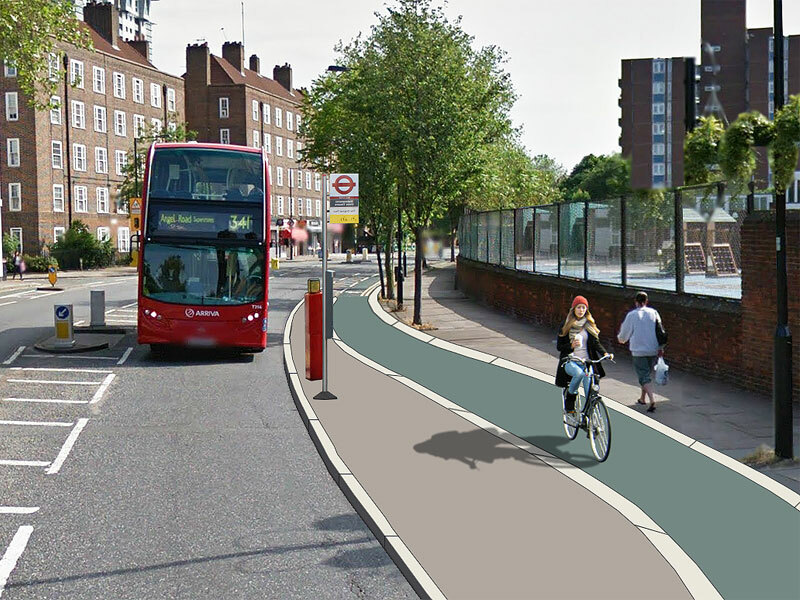 If you like the sound of this you should respond to TfL’s consultation telling them how much you love this design. Update: It seems that Hyde Park has been ridiculous for years, and I’m far from the first blogger to cover it. See this 2011 article on Vole O’Speed, and this 2012 article on As Easy As Riding A Bike. On New Year’s Day 2013 we went for a bike ride in Hyde Park. Actually, we first went for a walk. Crossing Westminster Bridge we saw four wide vehicle lanes almost devoid of traffic, but thousands of people on foot crammed onto the footpaths. At Parliament Square most of the road was blocked off to motor vehicles due to some parade or other, which gave us a clear view of just how much space is taken up by the huge expanse of tarmac we call ‘the road’. As The Mall and Constitution Hill were closed to motor traffic, we hired bikes and rode along the ridiculously wide roads to Hyde Park Corner, where we squeezed in to share the tiny two-stage toucan crossing with the crowds of people riding bikes and walking. So far, our journey was a demonstration of how much space is available through much of London, and how much of that space is given to motor vehicles even when they’re massively outnumbered by people walking. Hyde Park itself should be a mecca for all forms of non-motorised transport. It’s a huge park so it should be great for walking, of course. But a park on this scale deserves to be great for riding a bike, rollerskating and jogging, too. But it’s not. Even here, the anti-bike planning is clear. On the baffling North Carriage Drive and South Carriage Drive there’s little more than a painted line to protect bike riders from taxis. On the equally baffling West Carriage Drive there is an off-carriageway cycle path on each side of the road – about 1m wide, painted on the footpath. It’s crap, but for me it’s still better than an adrenaline-filled ride along the busy road itself. I describe the Carriage Drives as baffling because I can’t work out why they’re there at all – there’s no need for a large road bisecting the park, and there are perfectly good roads outside the park so why are there parallel roads within it? Even if these roads are absolutely essential, why is the cycling provision on them so poor given the vast amount of space available? But what really annoys me is that so little space is given over to people riding bikes, and even walking is given short shrift when it crosses motor traffic. I mean, it’s meant to be a park, isn’t it? For people? Why is there a two-way unrestricted road running through the middle of it? 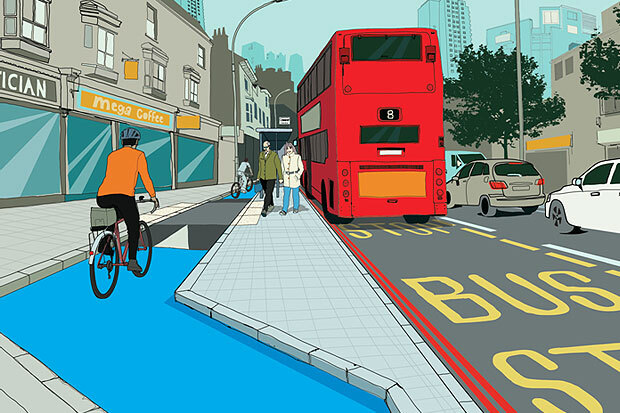 Even the most ardent ‘little Londoners’ would find it hard to argue that there is a lack of space here – after all, the whole park is ‘space’ – yet people riding bikes are pushed into conflict with people walking, as both groups are crammed onto narrow strips of path with a white line down it. It’s confusing and unpleasant. Not that I want to turn this into a horses-vs-bikes debate – there is plenty of space for everyone in Hyde Park, it’s just very badly apportioned. Why are the foot- and cycle-paths so narrow? There’s nothing stopping them from being widened, and this would result in a much more pleasant park for everyone. And yet it’s immensely popular. When I was there on Tuesday it was chock-full of tourists riding hire bikes, lights blinking in the dusk. The Royal Parks, who manage Hyde Park, claim that this is a “fantastic green route“. Have they actually tried to ride a bike there? Or is this an example of “Hype Park”? Oh how considerate! One minute, people walking and cycling are crammed together on a narrow footpath, now all of a sudden they’re concerned about safety. Do they really think that there’s no solution other than to make bike routes longer and less desirable? At the moment, the cycle paths are dangerous, but only because they’re too narrow, and crammed onto the edge of a footpath. They’re an afterthought, installed on the cheap. Really, Hyde Park should (and could) be a great traffic-free place for walking and riding a bike, but due to the usual UK anti-bike planning, it’s not. (It’s better than almost everywhere else in London, but that’s faint praise indeed.) It should be great for leisure riding as well as for through-travel. For an example of what Hyde Park could be, see this article on ‘As Easy As Riding A Bike’ about Amsterdam’s Hyde Park equivalent, the Vondelpark.